Once again, Zenescope brings us another interesting twist on a classic childhood tale, this time a clever reinterpretation of Rudyard Kipling’s The Jungle Book. In this version of the story, a pirate ship with four small children on board crash on the shore of a mysterious jungle ravaged by war among rival animal tribes. Each of the battling tribes takes a child to raise as there own royalty as a means to temporally keep peace between them. Fifteen years later the children have become young adults, each with a destiny to face within an unforgiving jungle filled with danger. Growing up the Jungle Book was one of my personal favorite stories, so when I heard it was going to get the Zenescope treatment I was beyond excited. After sitting down and ingesting the debut issue, I find myself ecstatic to see how the series unfolds. They have done a wonderful job at reinventing the story for adult readers who grew up as I did loving the story, creating an almost Battle Royal vibe with this first installment. 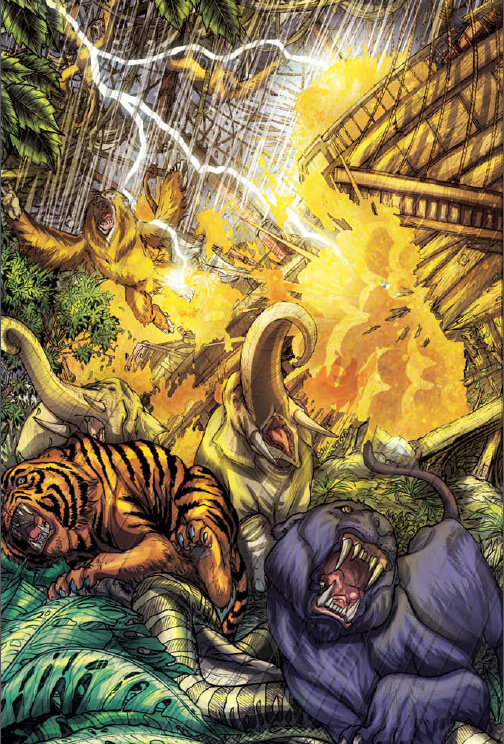 The writing is outstanding; in the first issue, readers are introduced to the well-known character Mowgli in the form of Mowglii, a female raised by wolves as well as the menacing Shere Kahn, and the panther Bagheera, followed by a brief peak a one of the series most iconic characters. What really sets this interpretation apart from countless others is the beautiful almost painting like art style the series showcases. The artists do such an amazing job capturing the brutally savage nature of the animals as they are locked into battle with each other. The emotionally charged panels depicting the shipwreck itself are some of the most breathtaking panels I have ever seen. It is authentically one of those moments where story telling and artwork come together in such a flawless way that the story before you explodes into life as your brain starts to visualize every panel as if it were in motion, throwing you head first into its world as if you are there. Out of all the classic reimagining’s I have read from the folks over at Zenescope, this is by far my favorite. If you are a fan of the Jungle Book mythos this is a absolute must own book, from start to finish I found myself completely enthralled and sucked back to my childhood, when I use to read the book and watch the movie obsessively. I highly look forward to picking up the next issue, and strongly recommend this series to any fans of the classic tale and any returning fans of past Zenescope reinventions of fairytales and stories many generations grew up on. Outstanding writing, picturesque artwork, and the highest quality of presentation make this a total package comic book experience that has the potential to be enjoyed but people of all ages and backgrounds.